Junior defensemen Dante Fabbro and Chad Krys combined for three goals and six assists in the Boston University men’s hockey team’s convincing 5-1 win over Merrimack College on Saturday at Agganis Arena. “[Fabbro and Krys] offensively and defensively were very good,” said BU head coach Albie O’Connell. It was Senior Night at Agganis Arena, as Class of 2019 Terriers Ryan Cloonan, Max Prawdzik, Shane Switzer, Max Willman and captain Bobo Carpenter were recognized in a ceremony before the game. “It was a big night for the Seniors,” O’Connell said. It was an especially significant game for captain Carpenter, who made his first appearance in over a month after being kept out for ten games with a lower body injury. The four skaters would lead the Terriers (14-15-4, 12-8-3 Hockey East) into the meeting with Merrimack (7-24-3, 4-18-12 Hockey East) as starters for the opening puck drop, and Prawdzik would enter the game late in the third period. “I thought the Seniors played well,” O’Connell said after the game. The Terriers came flying out of the gates, capitalizing on the game’s first penalty with a power play goal four minutes into the period. After seeing his stick snap on a one-timer attempt just seconds before, junior defenseman Dante Fabbro would grab a new twig and immediately find the back of the net on a shot that redirected off a Warrior skate and inside the far post to put BU up 1-0. The tally came on passes from freshman forward Joel Farabee and Krys, assisting the co-captain’s seventh goal of the season. Fabbro and Krys would factor in again for BU’s second goal later in the period, as this time it was the penalty-killing unit that provided a goal for the Terriers. Skating shorthanded 11 minutes in, sophomore forward Ty Amonte spotted a seam in the Warrior defense. Receiving the puck from Krys, Dante Fabbro slid a pinpoint pass forward to Amonte, who deked goaltender Craig Pantano and slipped the puck into a gaping net. Making the lead 2-0, Amonte’s seventh tally of the campaign also brought BU’s shorthanded goal total to a nation-leading 10 on the season. “I think we had no goals five-on-five,” said O’Connell in regards to his team’s effectiveness in special teams play to put up five goals without a tally at even strength. While unsuccessful with their two chances on the man advantage, Merrimack would find their legs in the second half of the opening frame. Freshman forward Chase Gresock tallied five shots on target by himself, carrying the visitors to a 17-7 advantage in shots on goal by the end of the period. We have to be willing to shoot the puck,” O’Connell said about trying to match Merrimack’s offense shot-for-shot. BU would weather the Warrior storm, holding the 2-0 lead at the break. With Merrimack taking another penalty three minutes into the second period, BU’s power play unit would go to work once again. Just twenty seconds into the man advantage, co-captains Fabbro and Carpenter combined to set up Krys with time at the left circle. Taking the space given to him, the assistant captain would unleash a laser past Pantano to provide the third-year Terrier with his sixth goal of the season, and BU with the three-goal cushion. Never deterred, Merrimack clawed one back four minutes later, persisting with the pressure that would result in a 30-20 shots-on-target lead by the end of the frame. Nearing the contest’s halfway point, forward Jordan Seyfert found forward Logan Drevitch shuffling in to junior netminder Jake Oettinger’s right. Firing away uncontested from the dot, Drevitch would beat the keeper to the far post, reducing the Terrier lead back to two with a 3-1 score line. Nine minutes into the period with the Terriers down a man again, Merrimack would concede a penalty of their own, and the Terriers would get the better of the Warriors in four-on-four play. At the 9:35 mark in the second stanza, Fabbro hit an open Krys from the first draw after the Merrimack penalty. From one hot hand to another, Krys reached the same position he took aim from for his first tally, and the result was no different. The junior’s shot trickled through Pantano and over the goal line, boosting the Terrier lead to 4-1. Krys’ two-goal night was just the second of his career, which has seen the Connecticut native find the back of the net 19 times through his three seasons. Krys’ father Mark, who also donned the scarlet and white between 1987 and 1991, only scored one goal as a Terrier. “I scored more goals tonight than he did in his career,” joked Krys about his father. With a back-and-forth second half of the middle period, both teams would threaten late, including a five-on-three opportunity for the Warriors. Following the theme of solid special teams play, the Terrier penalty killers would get the job done. After 40 minutes, BU were still on top, 4-1. With the power play unit firing on all cylinders through two periods, it was no surprise when BU were successful for the fourth time with the extra skater. A minute into a Merrimack penalty, Krys tossed the puck to Fabbro, who moved it along to Joel Farabee in the Terrier zone. The Philadelphia Flyers prospect did the rest, soaring through the Warrior defense and made a slick move to beat Drew Vogler, who had taken over for Pantano in net. Coming at the 3:33 mark, it was Farabee’s team-leading 13th tally, and the fourth assist of the night for Fabbro to make the lead 5-1. “The goal that Joel scored was a highlight reel [goal], ” O’Connell said. Killing off two penalties in the final eleven minutes, the Terriers put the finishing touches on an impressive victory. Oettinger would finish with 32 saves in just over 50 minutes between the pipes, and Prawdzik had four of his own after coming on in relief for the game’s final moments. The game would conclude with BU the 5-1 victors. It was a ten-point night for the defensive pair of Dante Fabbro and Chad Krys. Both were involved in every Terrier tally, as Fabbro notched one goal and five assists, while Krys knocked in two goals of his own to go along with three helpers. “Our defense helped our offense tonight for sure,” said O’Connell. The big win pushed the BU point streak to five games, and kept the Terriers in the hunt for home-ice in the Hockey East playoffs. With one game to play, the fifth-place Terriers now sit just one point outside the final position to host a quarterfinal matchup, currently occupied by UMass Lowell. With Saturday’s results across the league, BU is confirmed to finish between third and fifth in the division. “[The win] was definitely huge for us heading down the stretch here,” said Fabbro. The Terriers will march north to Orono to face off against the University of Maine in the regular season finale next Saturday at 7pm. With two games left in the Hockey East regular season, the Terriers will return to Agganis Arena tonight to square off against Merrimack. BU tied their most recent contest 1-1 at Providence, continuing their four-game unbeaten streak. While gaining only one point against the Friars hurt fifth-place BU’s chances at reaching the conference’s top four to secure a home-ice playoff game, losses from Northeastern and UMass Lowell last night mean that the Terriers are still right there in the hunt. As for the visitors, Merrimack bring up the bottom of the division standings, and are weeks removed from being serious playoff contenders. That said, the Warriors did put up a good fight in a 4-2 loss to league-leading UMass earlier this week, and beat BU 4-0 in October before falling to the Terriers 7-2 at Agganis Arena later in the season. It’s an ugly day. hockey fans. Can’t make it to Agganis? Our live blog has you covered! Join us for constant coverage and conversation throughout the game. The blog begins at 6:50pm, with puck drop set for 7. Approaching their second to last regular season game, the Boston University men’s hockey team is looking to continue their four-game unbeaten streak after tying Providence 1-1 on Thursday night. On Saturday, the Terriers (13-15-4, 11-8-3 Hockey East) will face the Merrimack Warriors (7-23-3, 4-17-2 Hockey East) at 7pm in Agganis Arena. Currently sitting at fifth in the Hockey East conference, there is reason to believe BU should win against last-seeded Merrimack. The Terriers were hungry for a win against Providence, who currently sit two spots above the Terriers in the Hockey East conference at second. With just two extra points under their belt, BU would have improved their case for a playoff game on home ice. “They [knew] the importance of the points tonight,” BU head coach Albie O’Connell said referring to his players. Once again, Boston University’s goaltender, junior Jake Oettinger, came out and had an unbelievable performance on the ice. The Terriers would have been looking at a whole lot different of a score at the end of game if it were not for Oettinger’s 45 saves. “Our goaltender was the story,” said O’Connell. As the game played on, BU started to lose the tenacity that they were playing with for the early stages of the game. This led to Providence finally getting the puck behind Oettinger in the 8th minute of the 3rd period. The Terrier’s response to this goal was not as strong as they would have liked to see. “At the end of the game we gave up a 3 on 1 with 30 seconds to go in overtime,” said O’Connell as he reflects on how close the tie was to becoming a loss. Now approaching Merrimack, BU has to play with the same force that they did when they came out against Providence. BU has already faced Merrimack twice this season; once back in October when the Terriers lost 4-0 on the road, and then again in January when BU bounced back at Agganis Arena and won 7-2. 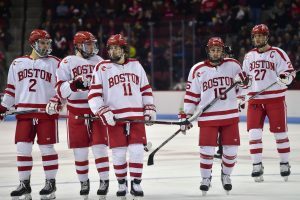 Although the Warriors have struggled in the Hockey East conference, they are not low on talent, and are definitely not a team that BU can overlook. One of Merrimack’s strengths is their depth when it comes to goalkeepers. Although it appears that senior Craig Pantano will start in between the pipes for Merrimack, but if necessary, the Warriors will have no problem throwing in their other two goalies: senior Drew Vogler and sophomore Logan Halladay. Both Vogler and Halladay have logged a sufficient amount of minutes for Merrimack. Supporting Pantano in the back is junior standout Ryan Cook. Cook has an impressive number of 37 blocks for Merrimack this season. Although he is a very strong player, BU mostly has to worry about him on the defensive end. Cook has tallied no goals for the Warriors this season so far. Freshman Chase Gresock makes up for it though with 11 goals and 13 assists to his name in the 2018/19 season. Gresock got on the board during BU and Merrimack’s last battle back in January, which resulted in a 7-2 Terrier victory. In addition, Merrimack just put up a very impressive fight on Thursday against league leading UMass. The score ended 4-2 UMass, but the Minutemen were only comfortable once standout defenseman Cale Makar tucked away an empty-netter. There are many more games to be played in the regular season before the Hockey East tournament. Currently, BU still sits 5th in the conference. However, the Terriers could come level with Northeastern if the Huskies lose to Boston College tonight or tomorrow. Likewise, BU could come level with UMass Lowell if the Riverhawks fall to New Hampshire tonight or tomorrow. If the seedings stand, BU will be traveling to Northeastern for the first round of the tournament. Before we start focusing on the Hockey East, BU has to focus on tomorrow and shutting down Merrimack. You can follow the game through our live blog as well as on Twitter. You can also listen to the game through GoTerriers.com. Looking to return to winning ways after a devastating late loss to Quinnipiac, the BU men’s hockey team broke out for three unanswered goals in the third period to down Merrimack, 7-2. Freshman Chase Gresock got the Warriors (7-17-1, 4-11 Hockey East) on the board first with a goal immediately from a faceoff win by senior Derek Petti just over eight minutes into the game. It was the third straight game that saw the Terriers (9-9-3, 8-5-2 Hockey East) go down early, having fallen behind by two goals in the first period against both Providence and Quinnipiac. However, as they did against both the Friars and Bobcats, the Terriers would respond well to the early deficit. At 14:34, David Farrance powered in a shot from the point on the power play to knot the game up at one. It was the sophomore’s third goal of the season, with assists from juniors Patrick Harper and Patrick Curry. “Just get the next goal” was the mantra Farrance identified as his team’s key to coming back after conceding first. With less than a minute remaining in the first period, BU would earn the lead through senior Ryan Cloonan with the assist credited to sophomore Cam Crotty. In a frenzy in front of the net, it was Cloonan who jammed the puck in to give the Terriers the advantage at the break, tallying his first goal of the season. “It was a sigh of relief,” joked Cloonan about finally scoring his first as a senior. Not only was it the first tally of Cloonan’s 2018-19 season, but it was also his first since his freshman campaign. Still, BU head coach Albie O’Connell has been impressed by the play of the Massachusetts native. “He’s played really well in the second half, and for the most part, all year”, commented the first-year manager. In the second frame, BU doubled their lead through a shorthanded goal by graduate student Max Willman at 9:39. The former Brown University Bear showed impressive speed to escape Warrior defense, and made a nifty move to pot his first goal of the season. With Willman and linemate Cloonan both scoring their first goals of the season, Coach O’Connell seemed optimistic about the potential for the two veterans to contribute offensively down the stretch. Junior Patrick Harper would make the BU lead three at 13:17 in the period, attacking a loose puck just outside the Merrimack crease for his second goal of the campaign. Only 20 seconds later, Merrimack freshman Logan Drevitch would negate the Harper goal with a breakaway effort to send the teams into the final intermission at 4-2. The game became a rout in the third, as BU tacked on three goals in nine minutes to seal the victory. Junior Dante Fabbro kicked off the onslaught with a rocket on the power play for his fifth of the season, assisted by junior Chad Krys and freshman Joel Farabee. Just four minutes later, Farabee assisted again, banking a pass off Merrimack netminder Craig Pantano and into position for sophomore Shane Bowers to net his ninth of the campaign. After four more minutes, David Farrance fired in his second of the game to cap off the victory for BU, assisted by junior Patrick Harper and sophomore Kasper Kotkansalo. With his third and fourth goals of the season, Farrance has already surpassed his total posted in his freshman campaign. The 7-2 BU victory was a far cry from the 4-0 thrashing the Terriers took at the hands of the Warriors back in October. “Tonight they had their legs, and we had trouble keeping up”, remarked Merrimack coach Scott Borek. From BU’s perspective, it was exactly the performance the Terriers needed to rebound from a heartbreaking loss against Quinnipiac two nights before. The Terriers will return to the ice on Friday night as they host a weekend series against Arizona State (16-9-1) in their final nonconference fixtures of the campaign, excluding the Beanpot. Following their first defeat of 2019, the BU Men’s Hockey team will look to return to winning ways against Merrimack in a late afternoon clash on Martin Luther King Day. The Warriors (7-16-1, 4-10 in HE) topped the Terriers (8-9-3, 7-5-2 in HE) by a score of 4-0 in the teams’ first meeting back on October 20, defending home ice with a dominant effort on both ends. Senior Mike Babcock and junior Logan Coomes scored early for Merrimack, and junior Johnathan Kovacevic and sophomore Laine McKay added insurance late. Senior Craig Pantano had 34 saves in the victorious shut-out, while a BU combination of juniors Jake Oettinger and Max Prawdzik came up with 24 saves collectively. It was the first time the Terriers were held goalless by the Warriors in the history of the fixture, and the third defeat in BU’s 0-4 start to competitive play. However, the team found life following a fourth loss to post a tie and three wins in their next four games. Trending in the opposite direction, Merrimack fell in two contests following their victory against BU, though both losses came against the University of Massachusetts, who have established themselves as one of the top squads in collegiate hockey all season long. In their most recent fixture, the Terriers fell 4-3 to Quinnipiac in heartbreaking fashion through a last-second goal by former Terrier Brandon Fortunado. BU fought back from being down multiple times in the contest, overcoming a two-goal deficit in the first period, and then leveling the game again in the third after the Bobcats had regained a one-goal advantage. BU’s loss was their first of the new year, having tied and won two games in 2019 ahead of the Quinnipiac matchup. While he did recognize his team’s resiliency, BU head coach Albie O’Connell knows his team can do better. After winning three consecutive games over Northeastern, Michigan and Connecticut, Merrimack also dropped their last contest with a 5-0 thumping against the University of New Hampshire on January 18. The Warriors’ struggles did not result from a lack of opportunities, as Merrimack tallied 25 shots in comparison to UNH’s 20, and gained the benefit of five Wildcat penalties. Defensively, five goals against is by no means a desirable total to concede, so Merrimack will be looking to recover on both sides in their visit to BU. Providing an offensive spark for the Warriors will be junior Tyler Irving, who holds a team-best 16 points and 11 assists. BU’s points leader, Dante Fabbro, has 18 this season, and leads the team in assists as well, with 14. Freshman Chase Gresock leads Merrimack in goals with six, while BU senior Bobo Carpenter has 10, holding the title as the only Terrier with a double-digit goal total thus far. Netminders Pantano and Oettinger carry save percentages of .896 and .923 respectively. Merrimack have entered a stretch of Hockey East clashes that will close out their season, currently holding a record of 1-1 since this run of divisional games began on January 12. As for BU, the Terriers will take a brief break from conference play to host a weekend series with Arizona State following the Merrimack game, before finishing the season with Hockey East matchups the rest of the way, and the ever-anticipated Beanpot in early February. All attention for both teams is on Monday’s game though, with momentum on the line and crucial Hockey East points up for grabs. How does Coach O’Connell think his team will respond from the devastating loss to Quinnipiac? “Don’t know yet,” responded the smirking head coach. BU vs. Merrimack can be watched on NESN and TSN, or listened to through GoTerriers.com. Puck drop is at 4pm, and the Boston Hockey Blog will have constant coverage of the game through the live blog. After completing his thirteenth year with Merrimack College, head coach Mark Dennehy was informed that he will not be returning to the Warriors’ bench next season. He was told of the move after losing game two of the Hockey East quarterfinals to Boston College saturday. The 21 losses this season are the most since 2014 in which their record was 8-22-3, Before his hiring, Merrimack lost 20 or more games in six of eight seasons. In the 2016-2017 season, Merrimack swept then No. 1 Boston University men’s hockey team. Assistant coach Curtis Carr will remain with the team and run the day-to-day operations while Merrimack searches for a new coach which will begin immediately. Associate Bill Gilligan was also relieved of his duties. Dennehy had a record of 168-243-60 at Merrimack, and made a NCAA tournament appearance in 2011. BREAKING: Merrimack will announce today that Mark Dennehy will not return as head coach of the men's hockey program. Dennehy was informed following last night's Game 2 loss to Boston College in overtime. Call it the curse of being ranked No. 1 nationally, place all the blame on head coach David Quinn, fault a player or line – whatever suits your boat, honestly. The fact remains, though: the Boston University men’s hockey team was just handedly swept by Merrimack College. Friday night’s 4-1 loss at Agganis Arena came just three days after the Warriors earned a 3-1 win at their place, giving Merrimack its first-ever sweep of BU. The sky isn’t quite falling around the scarlet and white, but it’s fair to sum the series up as disheartening and concerning. While issues persisted, one of the most concerning parts was how few Grade-A chances came Collin Delia’s way. The Merrimack netminder is by no means a bad goalie, but BU made him look like an All-Star all week. 1.) A recap of BU’s game at Lawler. 2.) A story on BU’s eight-game winning streak coming to an end at Merrimack. 3.) A recap of Friday night’s demoralizing loss at Agganis. 4.) A story on Clayton Keller emerging as a bright spot amidst dark times. As this space normally allows, we welcome all thoughts and frustrations. The task before BU doesn’t get any easier on Saturday night, as No. 7 University of Massachusetts Lowell comes to town. When the No. 1 Boston University men’s hockey team takes to the ice at Agganis Arena this weekend, it will be in a somewhat foreign spot: looking to recover from a loss. In fact, when Merrimack College snapped the Terriers’ eight-game win streak on Tuesday, 46 days had passed since the scarlet and white left the rink with anything less than a full two points. Unfamiliar feelings aside, BU (16-6-2, 9-3-2 Hockey East) made it crystal clear that Friday night’s rematch with Merrimack (9-13-3, 3-7-3 Hockey East) and Saturday evening’s clash with No. 7 University of Massachusetts Lowell are about getting back to business. For a full version of this story, check out Jonathan’s preview over on The Daily Free Press. Tuesday night was a dour one if you’re a fan of the Boston University men’s hockey team. Fresh off being ranked the nation’s newest No. 1 team, the Terriers traveled to Merrimack College and fell, 3-1. In head coach David Quinn’s four years at the helm, BU is now 0-3-1 at Lawler Rink. There are myriad excuses that can be made – tired legs, the small neutral zone at Lawler, an aura of pompousness – but the Terriers were simply outplayed against Merrimack. The compete wasn’t there. For more thoughts on this, check out Jonathan’s sider over on The Daily Free Press. As poor as the game was from a BU perspective, the night started off bright, with freshman defenseman Chad Krys netting on the team’s first shot of the game. It all went downhill from there on out, and junior netminder Connor LaCouvee was bested three times, all unanswered. For a full account of the game, check out Shelby’s recap over on The Daily Free Press. Looking down the road, BU next plays on Friday night against Merrimack at Agganis Arena. Revenge will be on the line. Ahead of that clash, we want to hear your thoughts below! We’re live at Merrimack’s Lawler Rink in North Andover, Massachusetts for a Tuesday night clash between BU and the Warriors. The Terriers are the nation’s newest No. 1 team, while Merrimack’s season can be defined by inconsistency. They’re 8-13-3 on the year; BU, on the other hand, is riding an eight-game winning streak. Trends aside, tonight’s tilt should be full of energy and intensity, as Lawler is probably the smallest barn in Hockey East. Be sure to follow along on our live blog for updates throughout the contest!